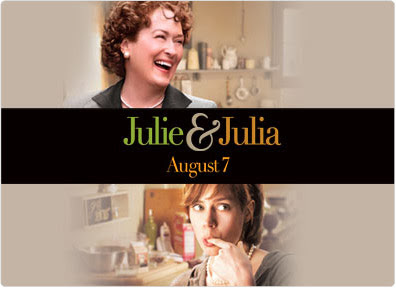 To celebrate the opening of Sony Picture's Julie & Julia, ICE (Institute of Culinary Education) is hosting a Julie & Julia 7 hour affair on Sunday August 8th and Saturday August 15th called "Cooking with Julia: A Film, Cooking Class, and French Supper." You will attend a screening of Julie and Julia in a theater close to ICE, then return to the school to cook a number of dishes from Julia’s classic book, Mastering the Art of French Cooking. At the end of the night, students will enjoy a fabulous French supper, sip Sancerre and Burgundy, and have plenty of time to talk about the movie and Julia’s influence on your cooking life. Chef-Instructor Melanie Underwood---whose first solo baking attempt, at 8, was the book’s éclair recipe---will lead you through the feast, as you make Moules a la Provencal; Quiche Lorraine; Petit Chaussons au Roquefort; Bifteck Sauté au Buerre; Concombres au Buerre; Champignons a la Greque; Carrots a la Concierge; Charlotte Malakoff aux Fraises; and Crepes Fourrees et Flambees. To enroll in the $115 event, call (800) 522-4610.